Are you ready for New Year’s Eve? There are a lot of New Year’s Eve events happening right here in Santa Ana! Antonello Ristorante – Where Orange County’s power elite and private groups dine on Northern Italian cuisine and drink from an extensive wine list. SPECIAL NEW YEARS EVE DINNER MENU. $69.95 per person (excludes tax & gratuity). Enjoy a 25% discount from our entire wine list when ordering this prix fixe menu. Bistro 400 – ‎8th Annual NEW YEARs EVE PARTY!!!! 6p to Close. Wow!! 2012!!! Party with us and D.J.Serge! Serving Dinner from 6p to 10pm then the COUNTDOWN PARTY BEGINS!!! With Fan fair and all! Drink specials all night with a free champagne toast at Midnight! Come and dance the night away and help us bring in the NEW YEAR! Not to mention (he is going to kill me) It’s the one and only PIERRE’S Birthday! And if you know Pierre, your sure to have a great night! Black Angus – Open at 10am ‘Featuring our full Dinner and BullsEye Bar Menus. 1350 No. Tustin, Santa Ana, CA 92705. Chapter One, The Modern Local – Click here to see their special New Year’s Eve menu. The Copper Door – Saturday 31st: 80’s Throwback and Timeless Dancefloor Clasics with DJ’s Milo Rock & Bobby Soul. The Crosby – Open on New Year’s Eve. Closing afterwards for some renovations. Darya Restaurant – Darya delivers on traditional and satisfying Persian comfort food. Geisha House – Not sure what they are planning. 2773 N. Main St., Santa Ana, CA, 92707. (714) 564-0350. Lemondrop New Years Eve Dinner & Dance, Classy Event for Adults Over 40, Saturday, Dec 31 8:00pm, at Embassy Suites Santa Ana – Orange County Airport North, Santa Ana. Lola Gaspar – Lola Gaspar, is a kitchen and bar that offers great regional food without the pretense. Our restaurant is situated in the historic Santora Building- the center of Santa Ana’s Artist Village. At Lola, we specialize in small plates and dishes made from scratch in our own kitchen. McCormick & Schmicks – For New Year’s Eve dinner, McCormick & Schmick’s Grille is offering Holiday menu specials including a prime rib dinner, a seafood trio and stuffed salmon. The regular kid’s menu will be available for dinner. The restaurant will close at 11:30 p.m., but the bar will remain open until 12:30 a.m. Make us part of your holiday tradition. New Year’s Eve. 4pm-11:30pm. Memphis at the Santora – Come for dinner and enjoy selections from our regular menu along with specials created just for the evening by Executive Chef Diego Velasco. Dinner served from 5pm with final dinner seatings at 10pm. Reservations are strongly recommended…call 714.564.1064 today. Morton’s Steakhouse – Five, Four, Three, Two… Fun. Ring in 2012 with warm hospitality, award-winning wines and champagnes, and the best steak anywhere! Now open on New Year’s Eve and New Year’s Day! The Observatory – XL NYE Weekend, Social Group & Observatory present ATB, Saturday, Dec 31, 2011, 8:00 PM, With Manufactured Superstars. Open to 21+. $100.00. The Olde Ship British Pub and Restaurant – Join us early as we celebrate and pipe in the the British New Year at 4pm. No reservations, first come, first served. All parties have to be present to be seated. Original Mike’s – New Years Eve Bash with the Reel Band live on stage plus, 2 DJ’s in STUDIO 51 plus BEYOND THE GROVE on the Patio and Live MARIACHI’s at MIDNIGHT! !The BEST PARTY IN TOWN!!! !Purchase your tickets today, $20.00 in advance and $25.00 at the door. The Playground – Not only will we have some delicious food and champagne for New Year’s Eve, we will also have some Deus and Mikkeller Nelson Sauvin Brut. Yum! We’ll have three levels of champagne (California, French “methode champagnoise” and fine French Champagne) and two “champagne” beers. The Proof Bar – 2012 NYE – Masquerade Theme. $10 Presale/$15 Night of the event. Come one and all to what is sure to be our most amazing event of 2011. Drinks, dancing, and great friends all come together for one night of “out with the old and in with the new”. Spoons Tex Mex – Not sure what they are planning yet. Tangata – Located at the Bowers. Not sure what their New Year’s specials are. The Velvet Lounge – They are offering a complimentary champagne toast with their $20 admission. Or try the Holiday Dinner package which costs $39.95 and includes your choice of steak, chicken or fish, salad, a non-alcoholic beverage, a desert, admission and a champagne toast. Yost Theater – Come join us for the most extravagant and anticipated New Year’s Eve party of the New Year at The Yost Theater. The Hottest New Club in the O.C. will be transformed like you have never seen before for this one night only featuring the finest of world renowned DJ, BENNY BENASSI! 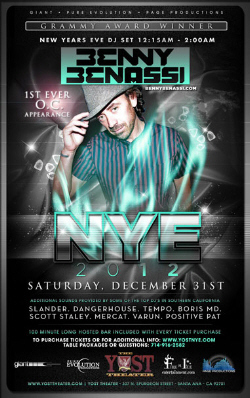 Ring in 2012 at YOST New Year’s Eve. The night begins at 8pm with 10 DJs and 6 bars keeping the party going until 2am. In celebration of Yost turning 100 years old, everyone will enjoy a 100-minute long hosted vodka bar, starting at 8:00pm on New Year’s Eve.